U.S. Navy Series Car #1 bears the silhouette of the Iowa Class Battleship U.S.S. Missouri, BB-63. Commissioned in 1944, ?The Mighty Mo? saw service in most major campaigns between WW2 and the liberation of Kuwait in 1991. Measuring 887 feet long with a beam of 108 feet, the Missouri was capable of cruising in excess of 30 knots. Her place in history was secured on September 2, 1945, when Japan surrendered to Allied Forces on her main deck, marking the end of WW2. This 50? 2-bay ACF Center Flow? covered hopper with round hatches is CN reddish-brown, has white lettering and CN logo and runs on Barber? roller bearing trucks. 50 2-bay covered hoppers were built by ACF in the mid 1970?s for the Detroit & Toledo Shore Line Railroad. The D&TSL was strategically located between Detroit, Michigan and Toledo, Ohio and serves important industries at Monroe and Trenton, Michigan. This 40? standard box car with plug door is car #39 of a 50-car series representing each of the 50 states in the union. It bears the Cardinal and Peony, Indiana?s official state bird and flower. The flag of the state of Indiana is in the background. The road number 1816 represents the year the ?Hoosier State? was admitted into the union. This 50? steel side, 14 panel, fixed end gondola wears the dark blue scheme with Golden West Service name and stacked block logo with white lettering and runs on black Barber? roller bearing trucks. These bright-blue cars were former SP, Cotton Belt and Rio Grande freight cars that were re-built and sold to various shortlines and then leased back by the railroad. All cars were painted in the same dark blue scheme with the Golden West Service name and stacked block logo on the side of the car. There were several shortline railroads for which the cars were lettered over the years as a class one. These lines included the Galveston Railroad (GVSR), Ventura County Railroad (VCY) and Cole Rail (CRLE). This black 100 ton 3-bay open hopper wears the large, white billboard with white lettering and runs on black Barber? roller bearing trucks. Built by the Frisco at the CMS Springfield, Missouri, shops in September 1977. Frisco hoppers from this series 88400-88599 were constructed using ACF kits. In the late 1970?s, the Consolidated Mechanical Shops (CMS), or Springfield Shops, built thousands of new cars on a single assembly line. This 50? standard box car with plug door is decorated to celebrate the longest running public service campaign in U.S. history?the Smokey Bear ?Forest Fire Prevention Series.? This series showcases the prevention message portrayed through colorful posters from the past 60 years. This poster was originally released in 1983. This green 40? standard box car with plug door, has white lettering and white, red and black monad herald and runs on black roller bearing trucks. This 50 car RBL series 98500-98549 was built in October, 1958 by Northern Pacific?s Brainerd, Minn., Shops. They were equipped with Pullman-Standard Compartmentizer load dividers and stenciled with the yellow and red Compartmentizer monogram. RBL class includes insulated refrigerator cars without the ice bunkers or refrigeration units used to ship products not requiring refrigeration but still needing protection from weather extremes. This box car red 40? standard box car with Youngstown door has white lettering, white ?The Southern Serves the South? herald and runs on black Bettendorf trucks and includes a freight load. This 2-ton box car was built at Pullman-Standard?s Bessemer, Alabama shops in September of 1938, carries the standard paint scheme used by Southern for decades. This red 50? standard box car with black plug door and sill has white lettering, black ladders and grab bars and runs on black roller bearing trucks. #40600 was delivered January 28, 1965, by Pullman-Standard. Numbered into 6 car series 40600-40605, these were the last new box cars purchased by the New Haven. The simplified Alpert scheme of large ?N over H? white letters was stenciled on the red body. These cars came equipped with a 30-inch travel Hydroframe-60 cushion underframe. The lading symbol on the door indicated that the car was equipped with interior anchors used to tie down cargo. 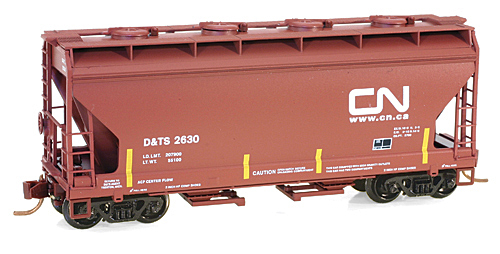 These mineral brown PS-2 70-ton two-bay covered hoppers are lettered in white with the ?Circle/Cross? square herald. They are members of the 82000-82499 series built by Pullman-Standard Car Manufacturing Co. in May of 1957. The principle commodity they handled was cement with typical lading including sand, soda ash, lime, alumina, fertilizers, dolomite, soap, salt, plastic pellets and flour. Since many of these materials are highly corrosive, the PS-2 was designed to withstand their inherent effects and keep maintenance regulations to a minimum. This 50? standard box car with double door is painted box car red with white logo and lettering. It was built in November of 1959 in the B&O shop in Hamilton, Ohio. The decoration of this particular car shows a separate ?B&O? as part of the reporting mark. Assigned to ?Sentinel? (car load) expedited service, it wears the one-color promotional.